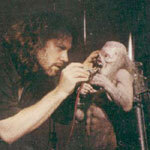 Eddie did not have a body until Iron Maiden met Derek Riggs, who designed a body to accompany the head. The band subsequently decided to keep this body secret until their first album 'Iron Maiden' was released. In 1980 the body was revealed, with the first incarnation of Eddie looking remarkably different from other Eddies since. It also only showed the top half of his torso. Eddie caused much controversy for the band on the Sanctuary and Women In Uniform single covers. 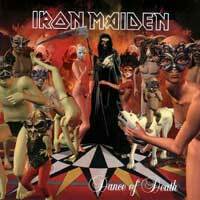 The Sanctuary cover depicted the Iron Maiden mascot having stabbed Margaret Thatcher to death. (Margaret Thatcher was the British Prime Minister at the time). This was censored out and widely believed to have been banned by Magaret Thatcher herself which is false. Rod Smallwood (the bands manager) had decided the black bar that was put on the cover to censor it was good publicity. The black bar is only present in the UK edition, the European releases do not have it. On the Women In Uniform sleeve Margaret Thatcher is shown hiding behind a wall waiting to ambush Eddie with a sub-machine gun, Eddie is shown walking along hand in hand with a nurse and a schoolgirl which caused more controversy and ended with feminists branding Iron Maiden sexist. 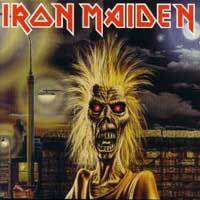 For Iron Maiden's album Piece Of Mind Eddie was in a mental asylum and had been lobotomised (the reason for the bolt on his head). The bolt from this has remained with eddie throughout the years. 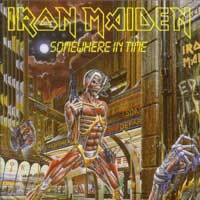 The Somewhere In Time logo is full of hidden messages (All of which were featured in our article, Somewhere In Time Cover Art Secrets) and shows Eddie as a futuristic being with a laser gun, looking much like a 'Terminator' (Terminator I was released in 1984, with Somewhere in Time released in 1986 so this was very much the imagery of the time). This graphic imagery can be directly contrasted against the Seventh Son Of A Seventh Son artwork, which shows just the top half of Eddie over a lake with his own entrails clutched in his hand. The Virtual XI cover was based on the Ed Hunter video game in which you play as Eddie blasting your way through many familiar parts of Iron Maiden's history. The reunion album Brave New World (2000) featured an Eddie face smiling down from the sky on a futuristic London. Some regard this as the best Iron Maiden cover artwork ever.Shortly afterward, after he produced artwork for the Wicker Man single release that was rejected, Derek Riggs announced that the Wicker Man single release art would be last piece that he would create for Iron Maiden, attributing this to the fact that "they are too difficult to work with"
Eddie has evolved greatly over the 25+ years of Iron Maiden's career and he will undoubtedly evolve and change with the band, before their reign at the top of Metal music is over.